There's quite some choice when looking for best electric massage chair, also indicated as robotic, mechanical, electronic, automated or power recliner chairs with massage and heat. The Kahuna LM-6800 and the Relaxonchair MK II might be qualified as "Best Massage Chair Under 2000". People who need or want body massage on a regular basis, often choose a massage chair due to cost efficiency and comfort. Here's a summary of a study, published by the National Institutes of Health. It may help you in how to choose a massage chair. You don't have to make appointments with a therapist, and in the comfort of your home you can enjoy a relaxing massage at any time you want. Because of flexibility, most massage chair have synthetic leather. Most massage chairs are equipped with mechanical as well as air compression way of massage. Mechanical massage is the therapeutic massage through rollers, for deeper massage treatment. Air bags for compression is usually for body parts such as feet and achilles tendons. Swedish massage is the most used massage type aimed to relax the body and exists of long gliding strokes and kneading motions, in order to support blood circulation. You often see Shiatsu mention in connection with massage chair. Shiatsu is a physical therapy to release tension in certain body areas that supports and strengthens the body's natural ability to heal and balance itself. More quality and features in a chair = higher price. Like with many products, the more quality and features a massage chair has, the higher the price. You can think of features such as type of wheel roller system, number of back rollers, number of auto-programs, speakers, time-length of massage sessions, weight and length limit, and design. The price of a good robotic massage chair is from $2500 and up. What's also important is the ability of the massage chair to provide you with deep tissue massage, without being painful or experiencing a mechanical feel. For example back massage in an electric massage chair should be an efficient relaxation approach, concluded in a study. Massage chairs are sometimes mentioned relax your back chairs, but back chairs usually aren't equipped with the massage functions. Maintenance of the massage chair. If you're looking for a massage chair you might consider checking how easy it is for the average person to do maintenance or repair. Usually massage chairs existing of modular units are easy to access the inner components. A massage chair should be customizable via the remote control that comes with the chair. You should also be able to set the massage intensity for specific body areas. A good foot massage can be of great influence on your overall feeling of well-being. You might consider the above mentioned features when you want to purchase top rated massage chairs. Or you might want to read about how to choose a massage chair. 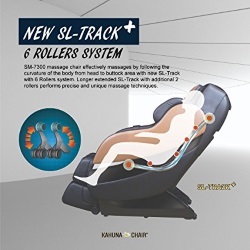 This massage chair provides effective massages by following the curvature of the body from head to buttock area with new SL-Track with 6 Rollers system. Longer extended SL-Track with additional 2 rollers performs precise and unique massage techniques, says the manufacturer. This Shiatsu Ideal chair is also quite suitable for reducing fatigue and pains such as back pain. You can treat your back by controlling and adjusting the massage rollers at any point of your back or body. With the built-in heat function you can relax your back muscles. The chair is available in the colors: Beige, Black, Dark Brown or Red. 3 years on the body, frame and on all electronic parts. See Amazon here for the great-rated Ideal Massage Chair. Two massage points relax your neck. 4 airbags move regulargy to compress shoulders. 4 massage points relax your back. Backrest can recline independently. 8 airbags wrap your arms and provide comfortable compression to relieve tension. Two massage points relax your waist and a waist heater warms up and promotes blood circulation. Hip side round compression airbags to massage the hip area and provide relief. Built-in hip vibration provides a comforting feeling to help you relax. 24 bags wrap your legs to offer a deep, ache relieving massage. Two special calf shiatsu points relieve leg ache. Foot roller massage and shiatsu foot heater for deep stimulation, relieving exhaustion and promoting blood circulation. Foot part is able to recline independently. The Real Relax full body zero gravity shiatsu massage chair is probably best suitable for people up to 6.1 feet or 73 inches (185 cm). The width of the sitting pad is 21.6 inches. Its weight capacity is 440.9 pound. This massage chair is made in China, comes with a remote control and manual. 3 Year warranty includes first year: covers free maintenance and repair for any defect in workmanship and materials. Second and third year: covers free shipping on replacements, but the cost of parts and maintenance work are for the chair owner. See Amazon Here for the great-rated RealRelax Massage Chair. By many this chair is also indicated as Bestmassage EC-06C, and features massage functions for neck, lower back, fatigue, arms, legs, thighs and feet. The chair is available in the colors: Black, Brown or Burgundy. One year limited warranty includes parts and labor. Shipping costs for parts and repair are for the chair owner. According to reviews and questions on Amazon it might be difficult getting in touch with supplier's service. See Amazon for the great-rated BestMassage BM EC06c chair. Three stage automatic Zero Gravity. The zero gravity function elevates your feet to the same level as your heart, minimizing the strain of gravity on your vertebrae, relieving the discomfort of back pain. Your heart can work less and you can relax more. The chair achieves up to 180 degrees flat bed position, so that your body weight is supported evenly throughout your body. Zero gravity positions can also optimize blood flow throughout your entire body. The rollers glide from the upper back all the way down under the seat towards the gluteus muscles to provide user with a full body massage. This new rolling system provides a full body massage. The L-Track innovation is especially beneficial for persons with lower back agony, have sore or tight glute muscles, or experience the ill effects of sciatica. Uniquely designed airbags that are strategically located throughout the chair inflate and deflate independently to provide relief of muscle tension and a wonderfully soothing effect. Airbags are programmed to apply acupressure to shoulders, arms, hips, calves, and feet (3 levels of airbag intensity control). More features of this chair. The company recommends a user body weight limit of 280 lbs. Although the company is California-based, this robotic massage chair is manufactured in China and comes with 3 year limited warranty for home use and covers structural framework. There's one year (first year) coverage on parts, that have to be replaced by the chair owner. Shipping costs of parts to service center are for chair owner. See Amazon Here for the great-rated Relaxonchair Massage Chair. A great-rated massage chair designed by doctors and only available at Amazon. The L-Track full body massage chair features a set of vertically movable, four wheel driven, muted intelligent massage hands. The L shaped back track fits the curves of your body. Zero gravity position allows a more relieving massage when virtually feeling weightless. The scan technology automatically detects the position of a user's body and adjusts the chair to deliver targeted therapeutic massages. The chair features pre-set massage techniques such as shiatsu, kneading, flapping, knocking, and simultaneous kneading and flapping, and comes with 6 automatic massage programs. The are 2 memory functions so you can store your favorite chair positions and massage settings between sessions or different users. Massage modes for the upper body have three options, fixed, partial and overall massage, with five levels of speed. In flapping and shiatsu modes and knocking, the width between the two kneading balls is adjustable with three levels: wide, medium and narrow. On partial and fixed point, the massage hands can move up and down to more accurately adjust the massage point. This function has three modes: full body, arms, and legs. Each one has three adjustable intensity levels. This feature is attached to the chair and is designed with a roller massage function that covers the bottom of foot, and includes two pairs of papillae for toe root rotating massages, as well as a mastoid skin scraping massage for the heels and arches of your feet. This heating function in the backrest uses a carbon fiber far infrared heat source to produce radiant heat that warms your body from the inside out. The backrest frame slides down to keep a minimum distance - approximately 2 inches - from the wall to preserve floor space. 53"L x 31"W x 44.5"H. When fully reclined, the length of the chair is 73". The maximum user weight that this chair can support is 330 lbs. 3-year limited warranty on replacement parts and first year on-site repair. See Amazon Here for the Medical Breakthrough Massage Chair. - Foot and Calf massage with automatically adjusted leg rest and adjustable intensity. You can choose from the colors: Black, Cream, Espresso, Grey or Red. Although the company is California-based, the chair is manufactured in Japan and is quite suitable for people who are about 5'. See Amazon Here for the new Novo XT massage chair, and review. - Heat for lumbar area. This chair comes with a 2-year limited warranty. See Amazon Here for the Renew 2 massage chair. Not sure, probably 3 years, only on structural frame. See Amazon Here for this fair-rated massage chair. You can choose from the colors Black, Cream, Dark Brown, Red or TruBlack Leather. There's a three years limited repair and replacement, on-site warranty. You can also purchase the five year extended warranty. See Amazon Here for this massage chair. This chair is equipped with true 3D massage, meaning the backrest rollers don't just go up and down, but the "hands" also go toward(in) and away(out) from your back. For people suffering from chronic pain and/or stress. According to the Colorado-based company their Robopad massage chair - manufactured in China or Taiwan - is quite suitable for people who suffer from chronic pain and/or stress and want deep muscle tissue massage, every day. The chair also features back stretch and comprehensive foot massage, including toes, heels, arches, insteps and achilles tendons. You can choose from the colors: Balck, Brown or Champagne. This true 3D chair comes with a 5 year warranty on mechanics, electrics, structure. See Amazon Here for the Elite massage chair. Also read the reviews there. This massage chair is built with all of the newest technological features based on biomechanics and physical therapy and incorporated additional features such as the space-saving design, a longer and S-shaped back rail, stretching function, magnetic therapy, and much more. It's really complete with a total of 78 airbags, 8 magnets, and two air pumps to provide you convenient massage experience while at home to help promote a healthier and more active lifestyle. Fully automatic zero gravity recline combined with integrated air bags allows you to relax while reducing spinal pressure and relieving lower back strain. Their roller system has 14 shiatsu rollers that conform to your individual back shape. Ypu can choose from fove massage modes to fully customize your massage. Integrated heating elements and air bags help maximize your massage effectiveness by increasing circulation and soothing sore muscles. These recliners feature a sturdy steel frame to provide support and comfort up to a maximum weight capacity of 330 lbs. Made with durable, bi-cast leather for easy cleaning. This Osaki massage chair features u.o. 4D massage technology/computer body scan. This massage chair is available in Black, brown or cream. - Fingertip controls located in the arm panels. See Amazon here for best pricing and info of this new Omega Montage Pro massage chair. The Earthlite company is well known for its portable massage chairs, massage and treatment tables, and accessories. You'll find here information about its three portable massage chair models Stronglite, Vortex and Avila. Read here more about the Earthlite massage chairs.